Before spring weather returns to the Shore area, there’s one last chance of some snow, forecasters said. 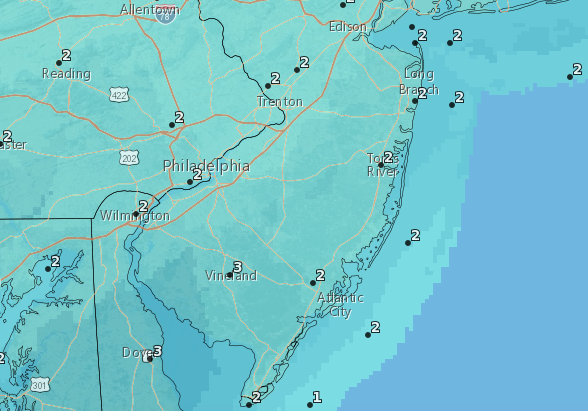 The region will dodge the full brunt of a coastal storm that could have dumped a great deal of snow on the area, though 1-3 inches are possible between Thursday night and Friday, according to the National Weather Service. Clouds will increase during the day Thursday, then there will be a chance of rain and snow before 8 p.m., followed by all snow during the nighttime hours. The overnight low will reach 29 degrees, with 1-2 inches of snow possible. On Friday, snow is likely before 10 a.m., then a mix of rain and snow as the day goes on. The high will reach 36 degrees, the forecast said, with gusty winds between 15 and 24 mp.h. The temperatures will dip back into the high 20s Friday night, though the precipitation will have mostly moved out by then. Saturday and Sunday are both forecast to be sunny with highs of 40 and 44 degrees, respectively. Warmer weather is predicted to move in next week, with temperatures reaching near 60 by Tuesday.